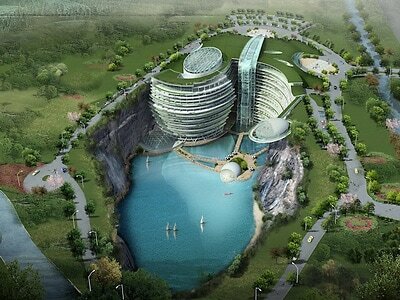 A 380-room luxury hotel is being built in China, and it's almost 100% underground. The InterContinental Shimao Wonderland, which will be located at the food of the Tianmashan mountain near Shanghai, is set to open in late 2014 or early 2015, which leaves just 2.5 years for builders to complete 16-story underground hotel. The hotel will be built in a quarry that is no longer being used, and only two of the 16 stories will be above ground level. The lowest level, which is where the hotel's restaurant will be located, will actually be underwater. "We drew our inspiration from the quarry setting itself, adopting the image of a green hill cascading down the natural rock face as a series of terraced landscaped hanging gardens. In the centre, we have created a transparent glass 'waterfall' from a central vertical circulation atrium connecting the quarry base with the ground level. 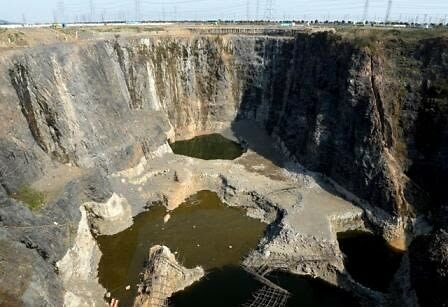 This replicates the natural waterfalls on the existing quarry face." There aren't too many details about what kinds of interesting features this underground hotel might have, but from the photos it looks like water will play a large role. 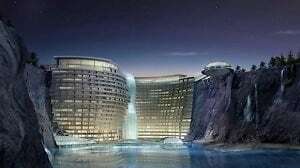 The InterContinental Shimao Wonderland hasn't started taking reservations yet, but with all the attention this unique hotel has been getting, they're pretty much set for a jam-packed opening weekend!